2 To illustrate how qualitative data may be analysed. 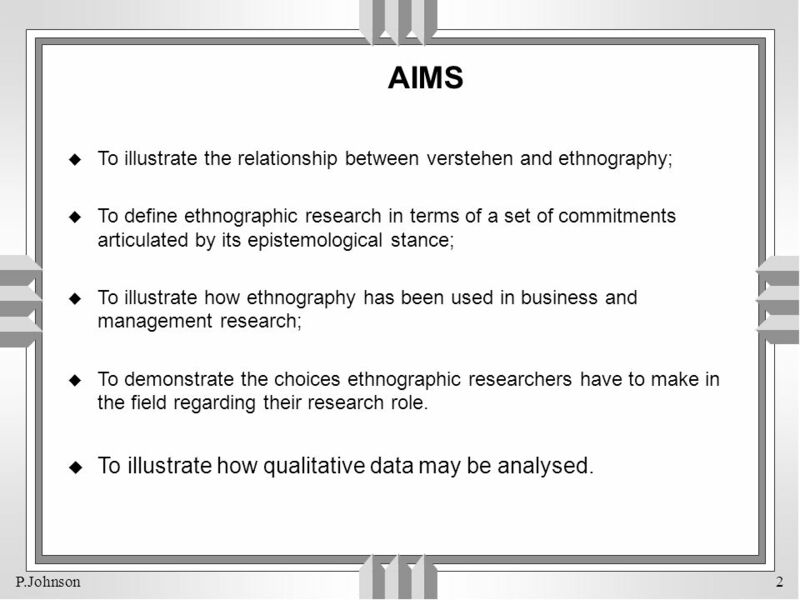 AIMS To illustrate the relationship between verstehen and ethnography; To define ethnographic research in terms of a set of commitments articulated by its epistemological stance; To illustrate how ethnography has been used in business and management research; To demonstrate the choices ethnographic researchers have to make in the field regarding their research role. 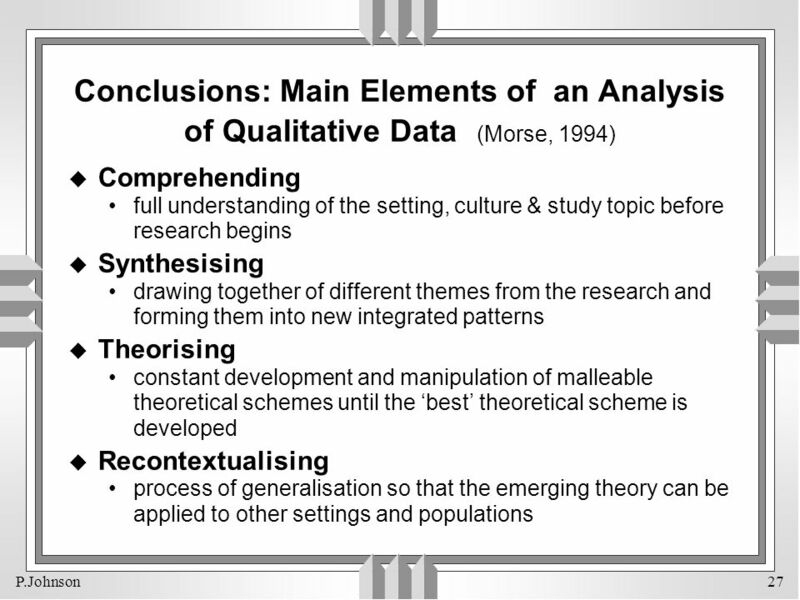 To illustrate how qualitative data may be analysed. 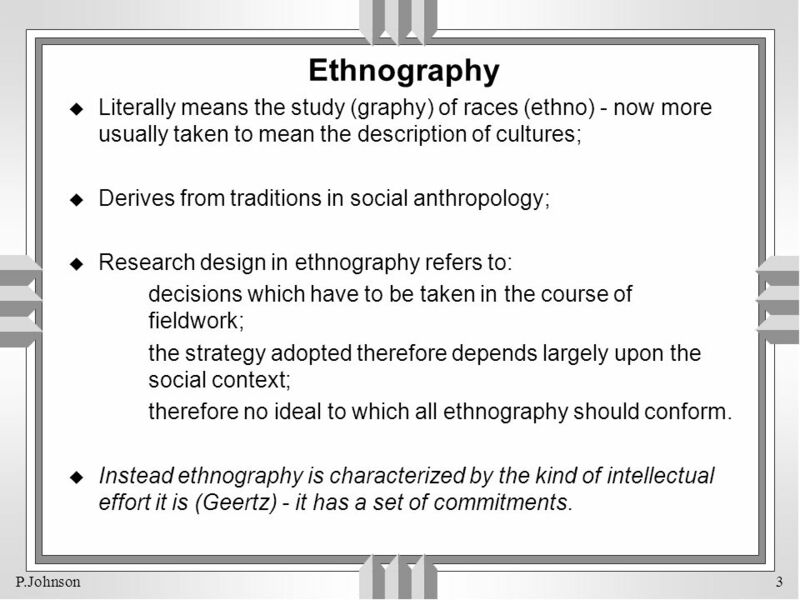 3 Ethnography Literally means the study (graphy) of races (ethno) - now more usually taken to mean the description of cultures; Derives from traditions in social anthropology; Research design in ethnography refers to: decisions which have to be taken in the course of fieldwork; the strategy adopted therefore depends largely upon the social context; therefore no ideal to which all ethnography should conform. 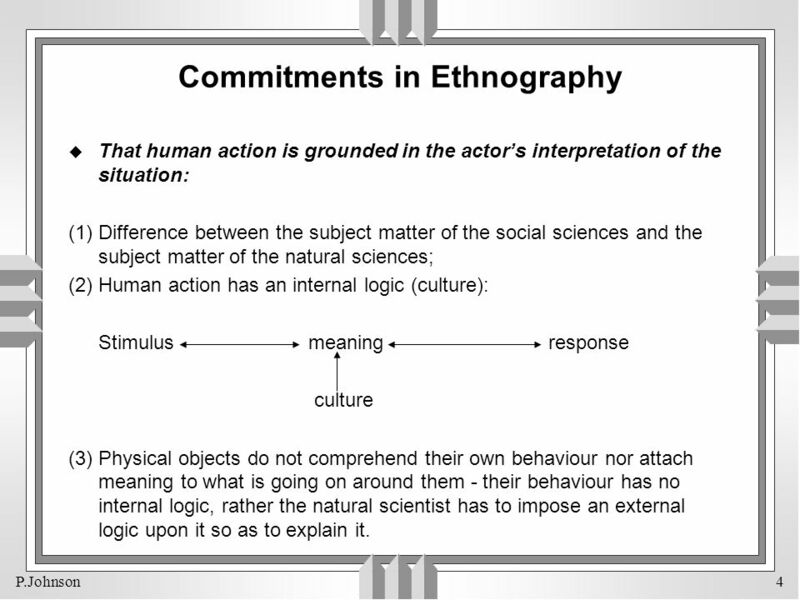 Instead ethnography is characterized by the kind of intellectual effort it is (Geertz) - it has a set of commitments. 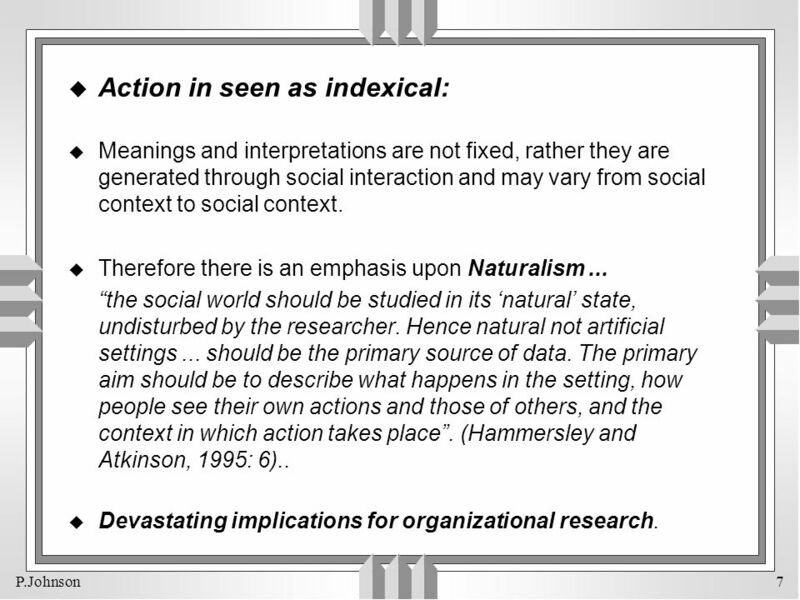 That human action is grounded in the actor’s interpretation of the situation: (1) Difference between the subject matter of the social sciences and the subject matter of the natural sciences; (2) Human action has an internal logic (culture): Stimulus	meaning	response culture (3) Physical objects do not comprehend their own behaviour nor attach meaning to what is going on around them - their behaviour has no internal logic, rather the natural scientist has to impose an external logic upon it so as to explain it. 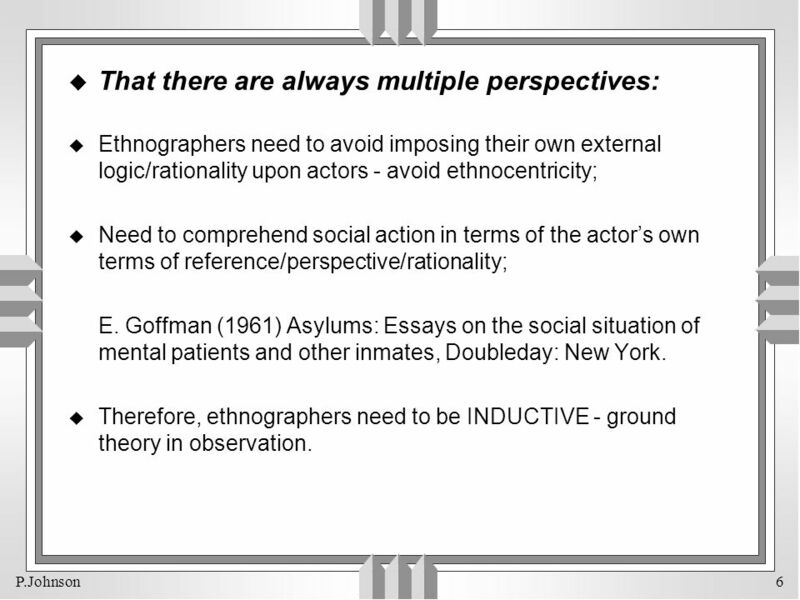 Ethnographers need to avoid imposing their own external logic/rationality upon actors - avoid ethnocentricity; Need to comprehend social action in terms of the actor’s own terms of reference/perspective/rationality; E. Goffman (1961) Asylums: Essays on the social situation of mental patients and other inmates, Doubleday: New York. 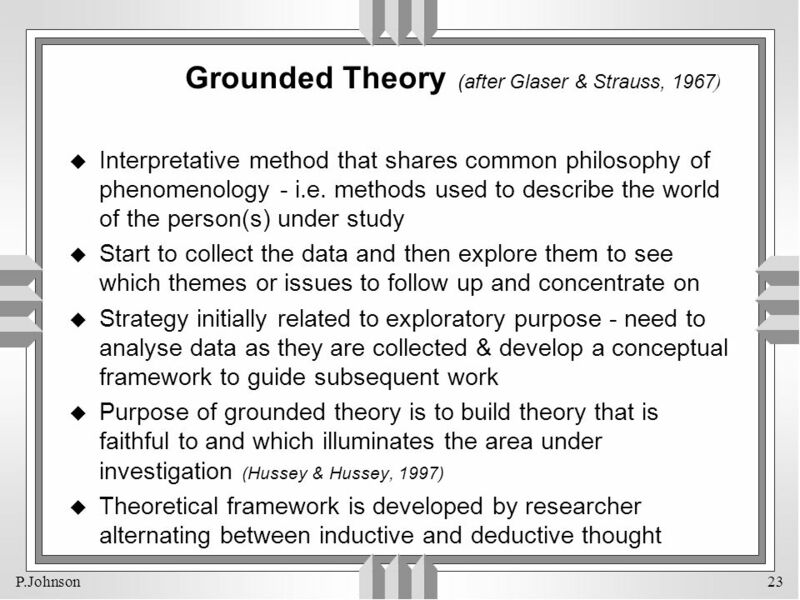 Therefore, ethnographers need to be INDUCTIVE - ground theory in observation. Meanings and interpretations are not fixed, rather they are generated through social interaction and may vary from social context to social context. Therefore there is an emphasis upon Naturalism ... “the social world should be studied in its ‘natural’ state, undisturbed by the researcher. Hence natural not artificial settings ... should be the primary source of data. The primary aim should be to describe what happens in the setting, how people see their own actions and those of others, and the context in which action takes place”. (Hammersley and Atkinson, 1995: 6).. Devastating implications for organizational research. 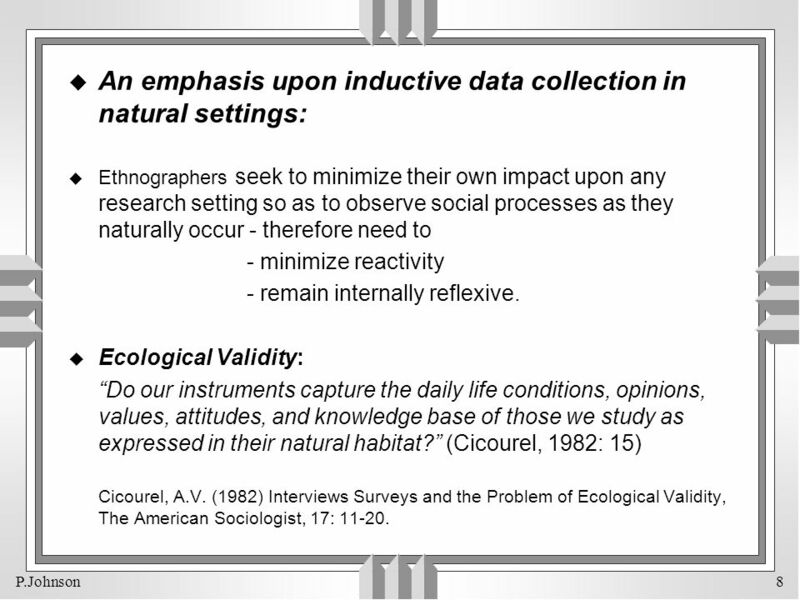 Ethnography is not one single method for collecting data but a battery of methods that enable observation of the behaviour of groups and individuals in their natural settings. 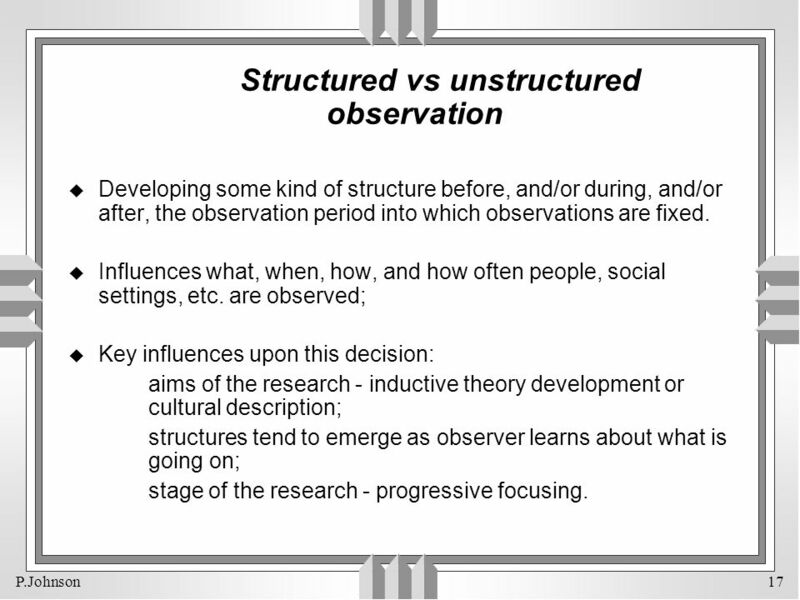 It entails the following options: Participant Vs non-participant observation; Covert Vs overt observation; Direct Vs indirect observation; Structured Vs unstructured observation; Methods of recording. A continuum that varies from complete immersion as a full participant to complete separation as a spectator. 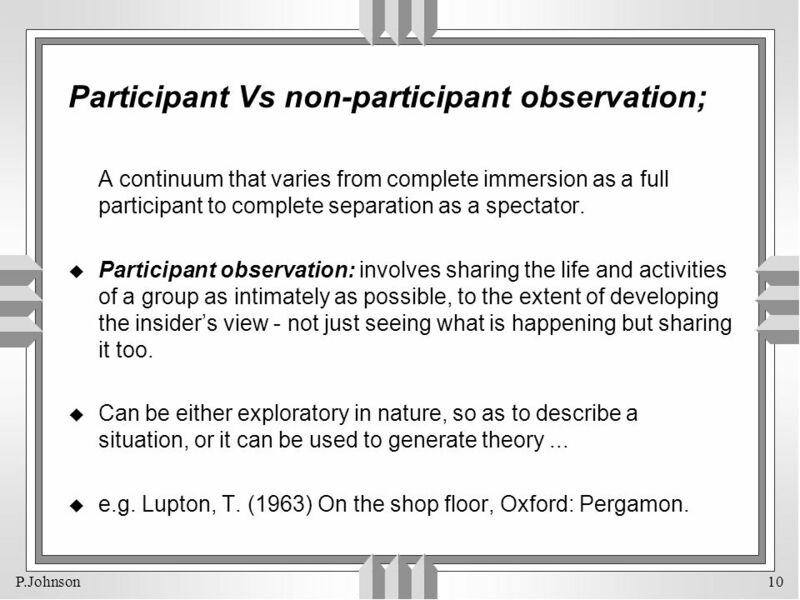 Participant observation: involves sharing the life and activities of a group as intimately as possible, to the extent of developing the insider’s view - not just seeing what is happening but sharing it too. Can be either exploratory in nature, so as to describe a situation, or it can be used to generate theory ... e.g. Lupton, T. (1963) On the shop floor, Oxford: Pergamon. 11 Participant Observation and Organizations. THE FRONT STAGE (GOFFMAN). ESPOUSED THEORIES (ARGYRIS). 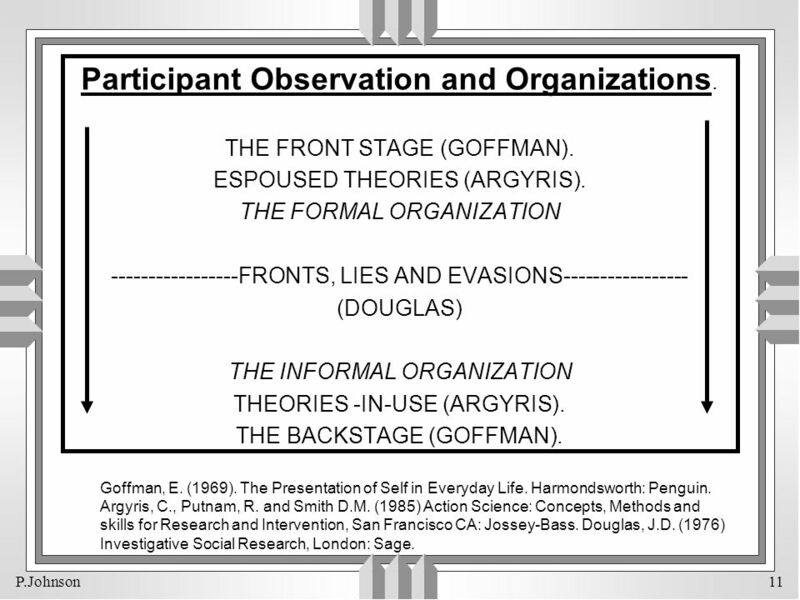 THE FORMAL ORGANIZATION FRONTS, LIES AND EVASIONS (DOUGLAS) THE INFORMAL ORGANIZATION THEORIES -IN-USE (ARGYRIS). THE BACKSTAGE (GOFFMAN). Goffman, E. (1969). The Presentation of Self in Everyday Life. Harmondsworth: Penguin. Argyris, C., Putnam, R. and Smith D.M. (1985) Action Science: Concepts, Methods and skills for Research and Intervention, San Francisco CA: Jossey-Bass. Douglas, J.D. (1976) Investigative Social Research, London: Sage. 12 major strength - good at getting access to what people actually do in organizations, rather than what they claim to do, or what they officially ought to do. but danger of “going native”. 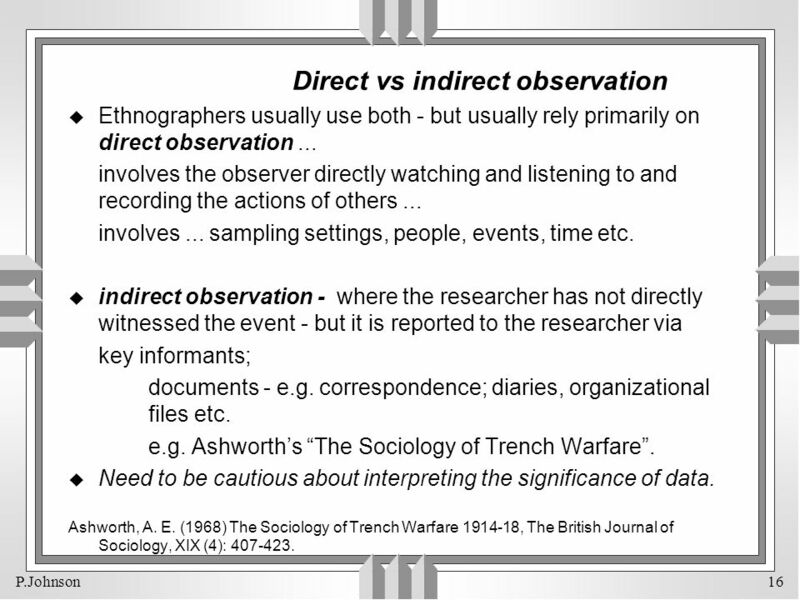 Non-participant observation: - where the researcher does not interact with the subject at all - just observes - e.g. through a two-way mirror. Advantage - reactivity reduced since it is less likely that the observer’s presence will affect the situation being studied. 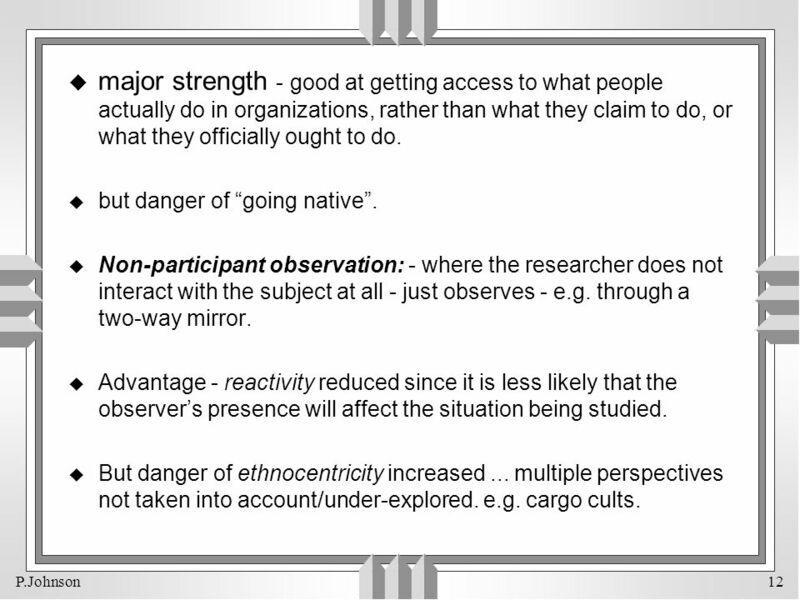 But danger of ethnocentricity increased ... multiple perspectives not taken into account/under-explored. e.g. cargo cults. 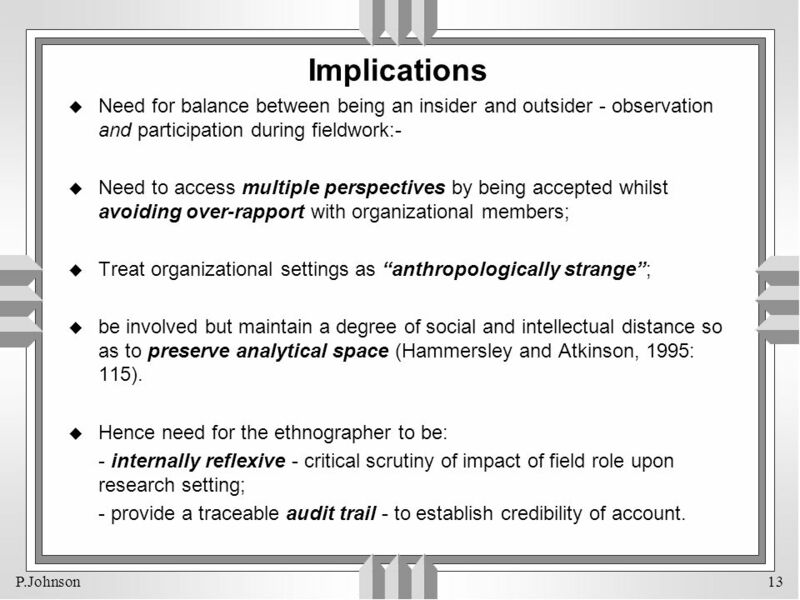 13 Implications Need for balance between being an insider and outsider - observation and participation during fieldwork:- Need to access multiple perspectives by being accepted whilst avoiding over-rapport with organizational members; Treat organizational settings as “anthropologically strange”; be involved but maintain a degree of social and intellectual distance so as to preserve analytical space (Hammersley and Atkinson, 1995: 115). 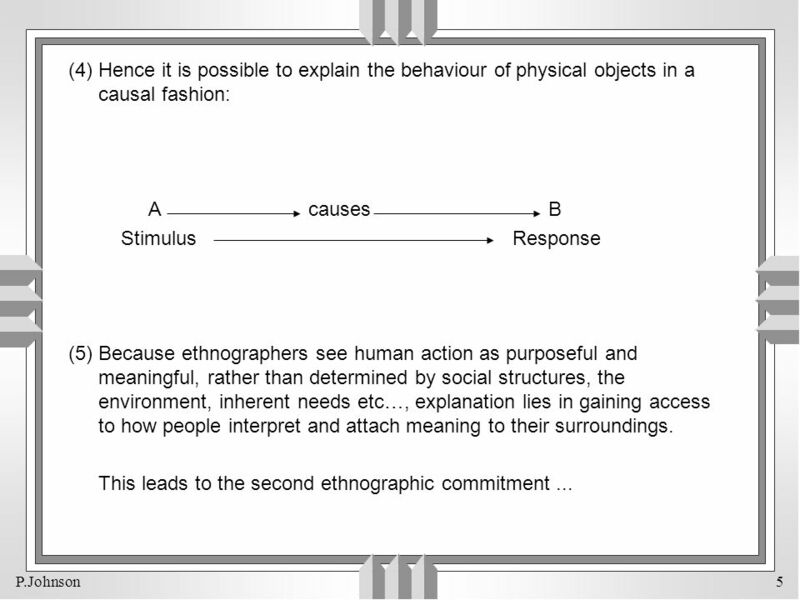 Hence need for the ethnographer to be: - internally reflexive - critical scrutiny of impact of field role upon research setting; - provide a traceable audit trail - to establish credibility of account. Whether or not the research subjects know, or are aware of the presence of the ethnographer; or whether the true purpose of the research is hidden from subjects. e.g. - Lupton’s On the Shopfloor - overt, but research purpose hidden. - Roy’s Banana time - covert - research role hidden. Developing some kind of structure before, and/or during, and/or after, the observation period into which observations are fixed. Influences what, when, how, and how often people, social settings, etc. 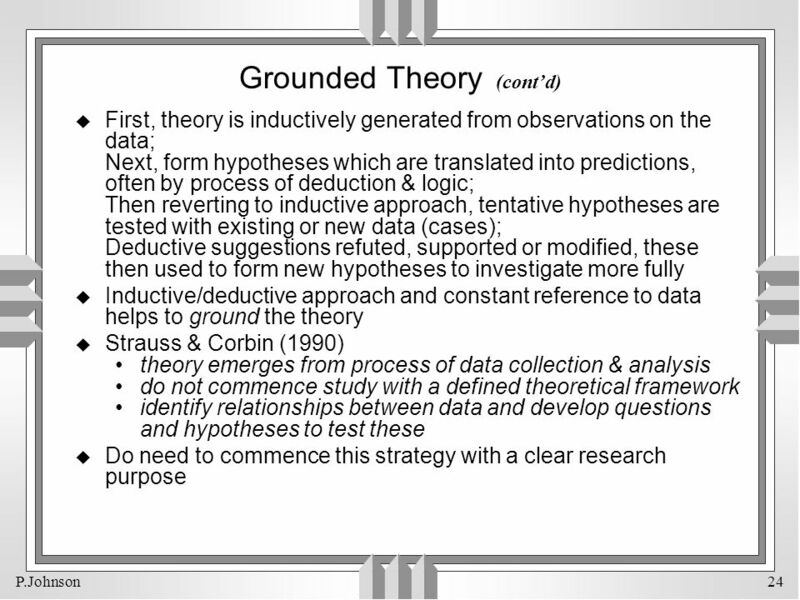 are observed; Key influences upon this decision: aims of the research - inductive theory development or cultural description; structures tend to emerge as observer learns about what is going on; stage of the research - progressive focusing. Choices range from note taking, keeping a diary, semi-structured questionnaires, observation schedules and inventories, tape-recording, videoing, etc. 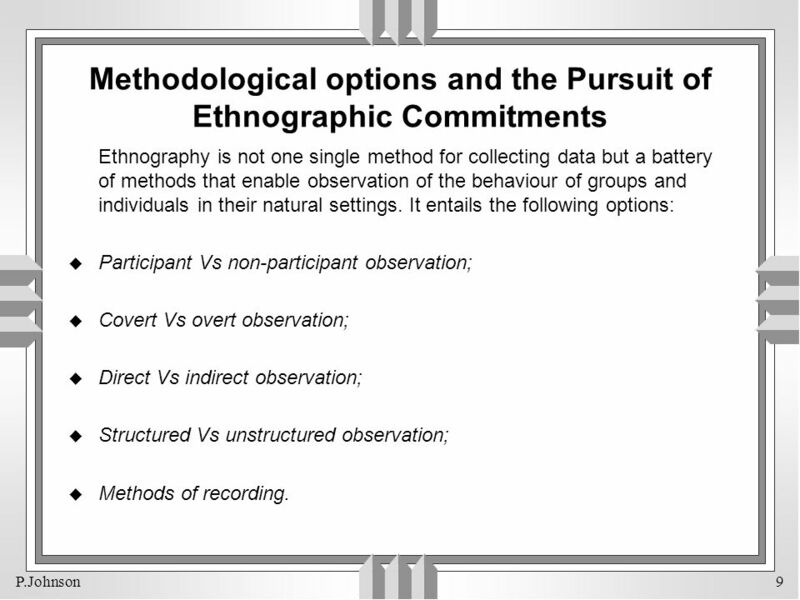 ; Choices much depend on prior decisions about methodological options and crucially the stage at which your research is at; Ethnographic research generates vast amounts of qualitative data - hence choice needs to take into account how the data is to be analyzed. 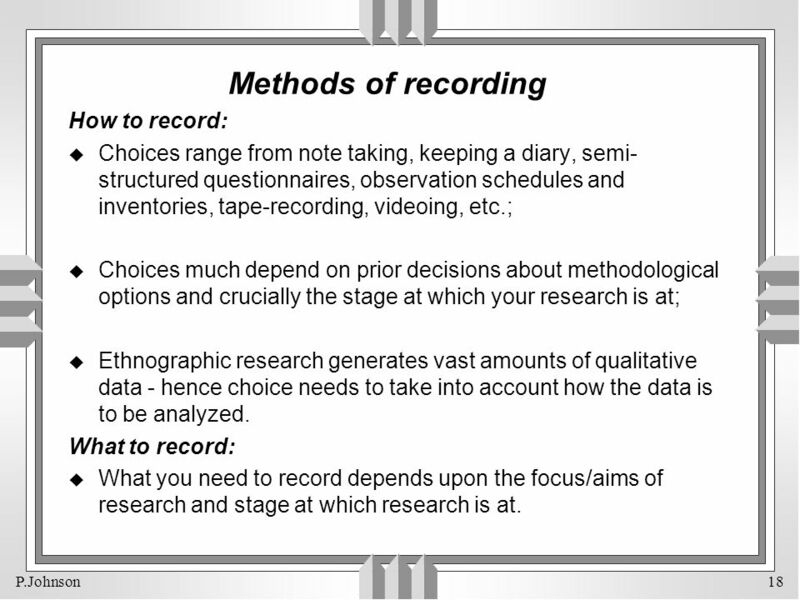 What to record: What you need to record depends upon the focus/aims of research and stage at which research is at. 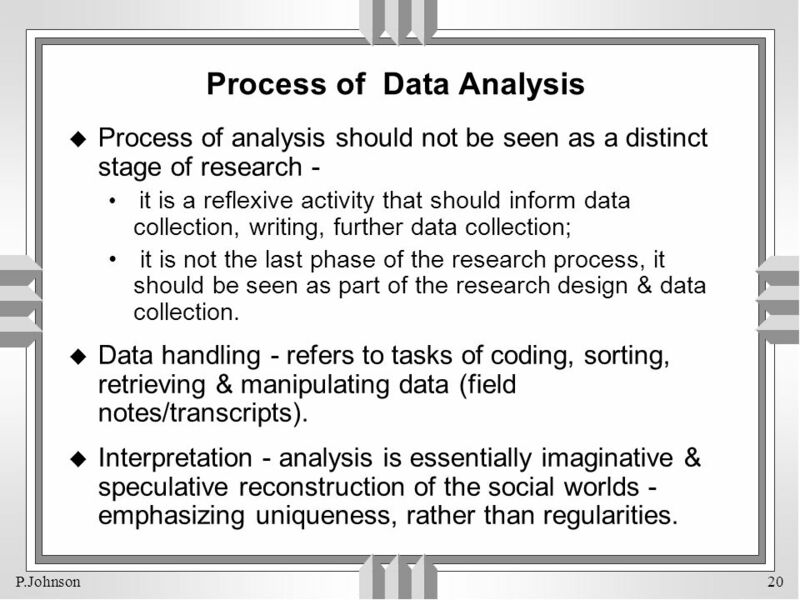 Process of analysis should not be seen as a distinct stage of research - it is a reflexive activity that should inform data collection, writing, further data collection; it is not the last phase of the research process, it should be seen as part of the research design & data collection. 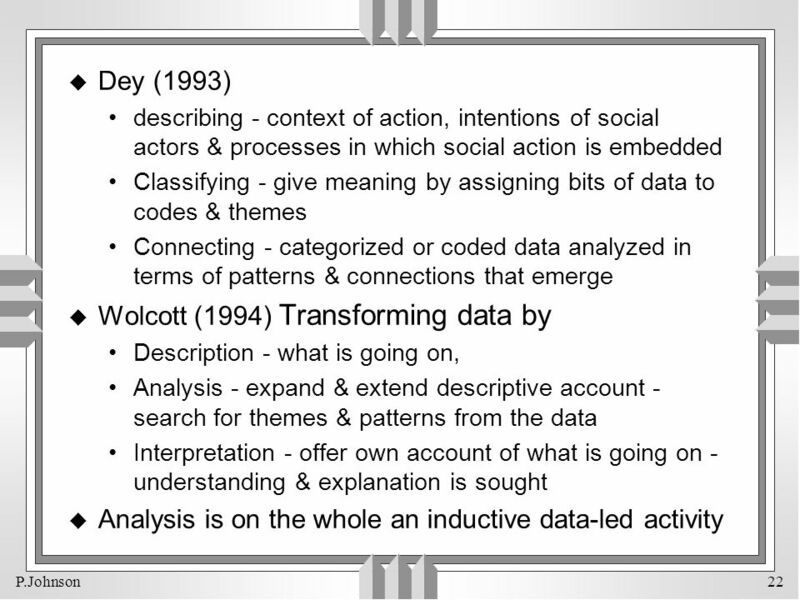 Data handling - refers to tasks of coding, sorting, retrieving & manipulating data (field notes/transcripts). Interpretation - analysis is essentially imaginative & speculative reconstruction of the social worlds - emphasizing uniqueness, rather than regularities. Data reduction - selection & condensation data reduced in anticipatory ways - data summarized, coded, broken down into themes, categories, etc. 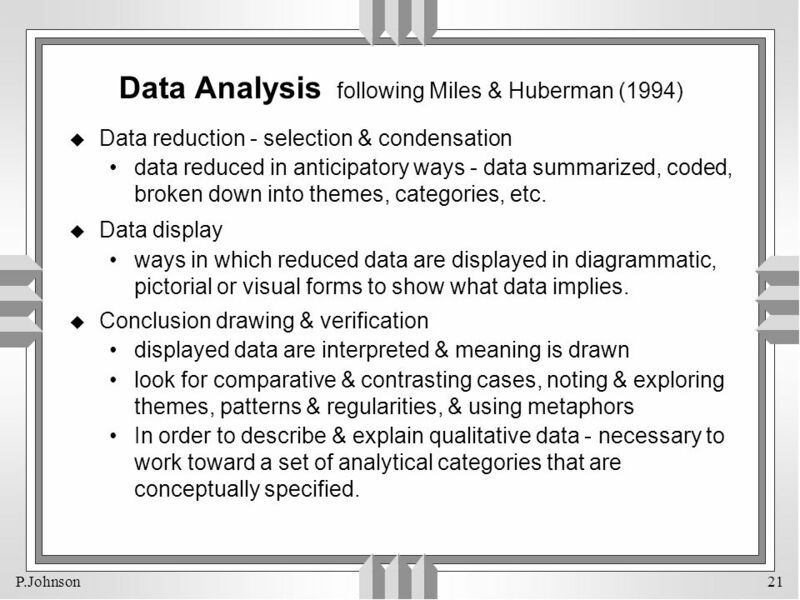 Data display ways in which reduced data are displayed in diagrammatic, pictorial or visual forms to show what data implies. Conclusion drawing & verification displayed data are interpreted & meaning is drawn look for comparative & contrasting cases, noting & exploring themes, patterns & regularities, & using metaphors In order to describe & explain qualitative data - necessary to work toward a set of analytical categories that are conceptually specified. Focuses upon the subjective, cultural aspects of organizations; Avoids research findings being artefacts of the method being used; When rigorously done, enables greater understanding of organizational processes and events; Allows focus upon hidden aspects of organizational life; Clarifies role of the researcher in producing organizational accounts. Micro level of analysis ??? 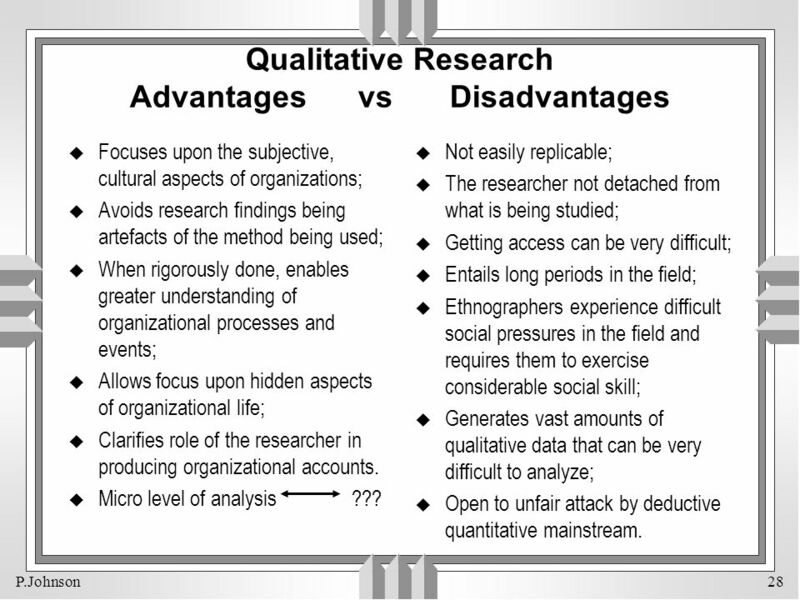 Not easily replicable; The researcher not detached from what is being studied; Getting access can be very difficult; Entails long periods in the field; Ethnographers experience difficult social pressures in the field and requires them to exercise considerable social skill; Generates vast amounts of qualitative data that can be very difficult to analyze; Open to unfair attack by deductive quantitative mainstream. 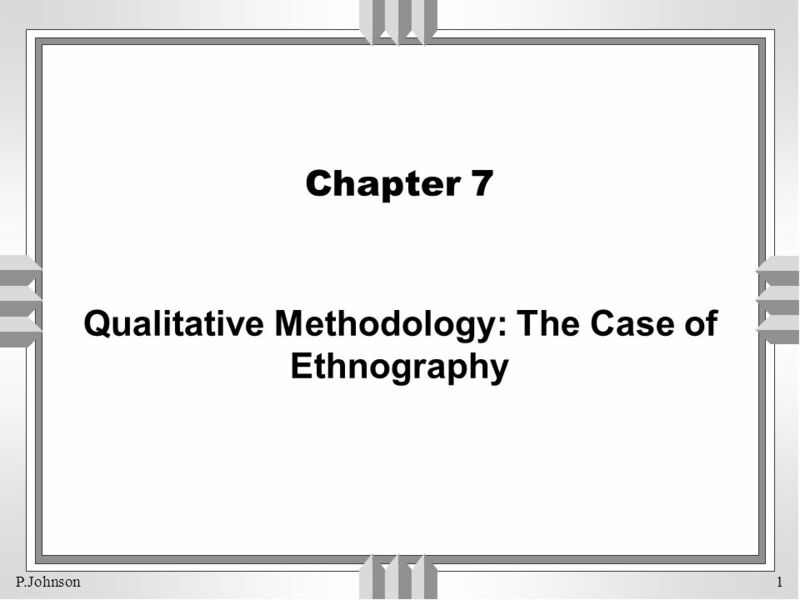 Download ppt "Chapter 7 Qualitative Methodology: The Case of Ethnography"
Qualitative Research. 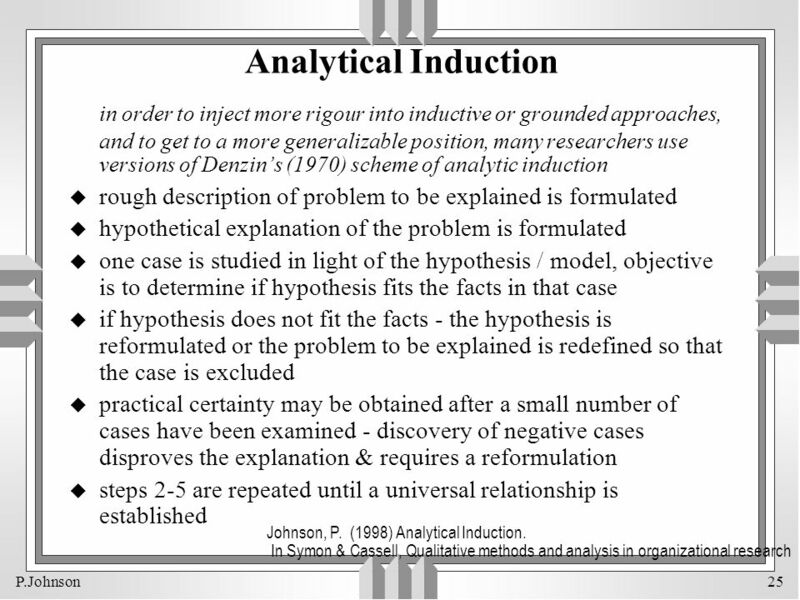 Definitions l Quantitative Research - investigation in which the researcher attempts to understand some larger reality by isolating. Desmond Thomas LTU Developing effective reading strategies and productive routines Dr Desmond Thomas, University of Essex. 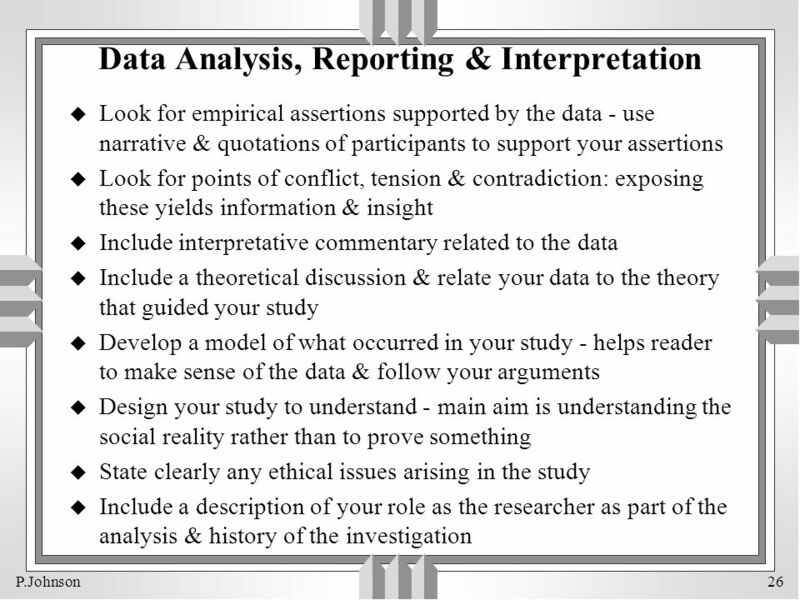 Analytical methods for IS professionals ISYS3015 Qualitative research methods Data collection. ISYS 3015 Research Methods ISYS3015 Analytical Methods for Information systems professionals Week 2 Lecture 1: The Research Process. Qualitative Research. 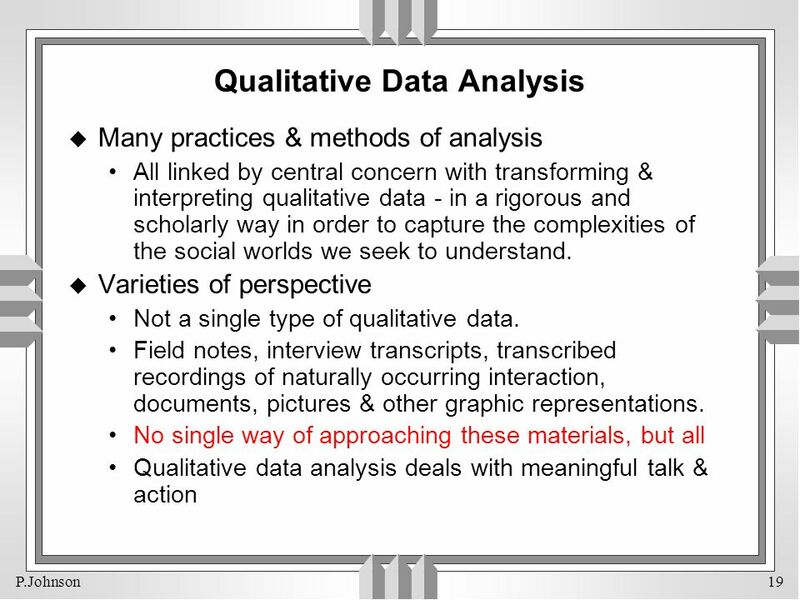 Comparing Qualitative and Quantitative Methods Before discussing the differences between qualitative and quantitative methodologies. Case Studies and Review Week 4 NJ Kang. 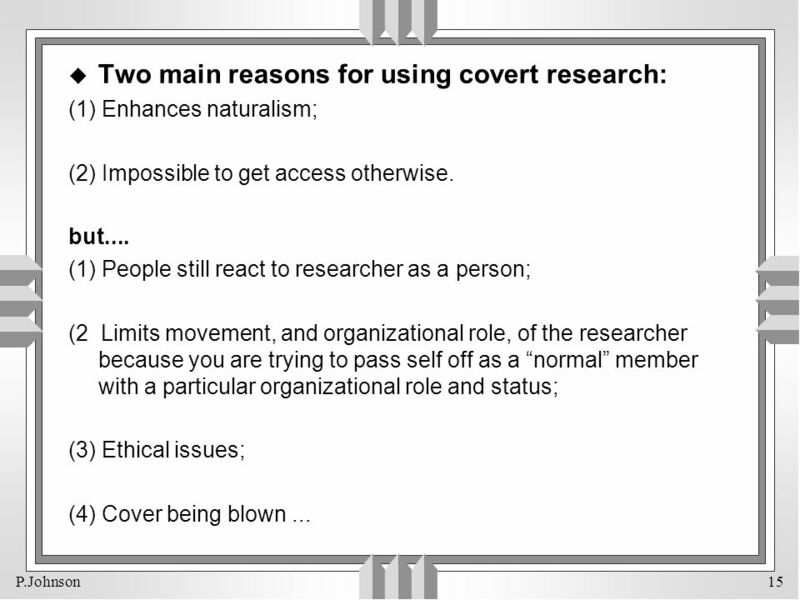 5) Studying Cases Case study is a strategy for doing research which involves an empirical investigation of a particular.